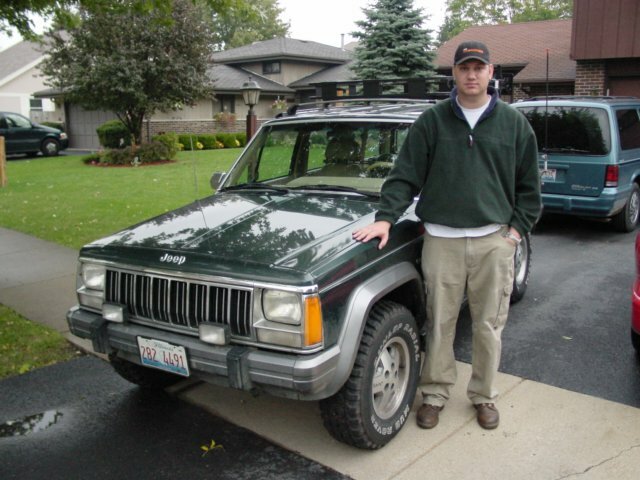 Me and my Jeep ready to drive west! The fun part of the trip started when we got about halfway through Iowa on Saturday and my rear main seal decided it was time to let go. My Jeep started losing oil pretty quickly at that point. Every time we stopped for gas I would have to add more oil. I ended up going through 5 quarts of oil on the rest of the trip to Utah. It’s a good thing I had brought plenty extra with me. 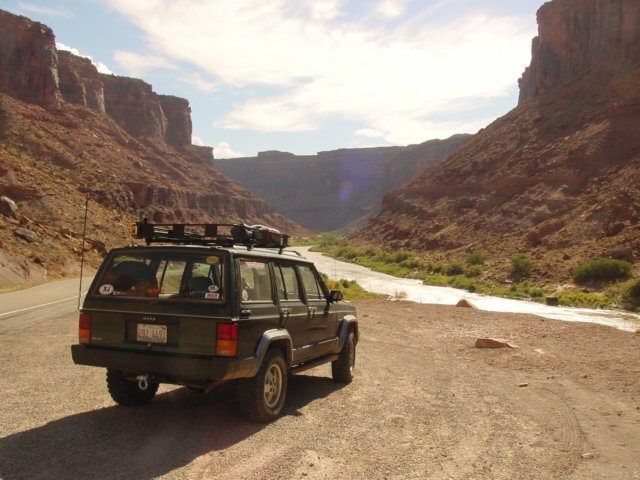 By the time we had reached Utah, the back hatch of my Jeep and the entire undercarriage was coated in oil. I probably left a nice trail of oil along I-80, I-76 and I-70! On Saturday we made it to Idaho Springs in Colorado where we spent the night, and then on Sunday we finished the drive to Moab in the afternoon. We ended up taking the scenic route on Highway 128 along the Colorado River. 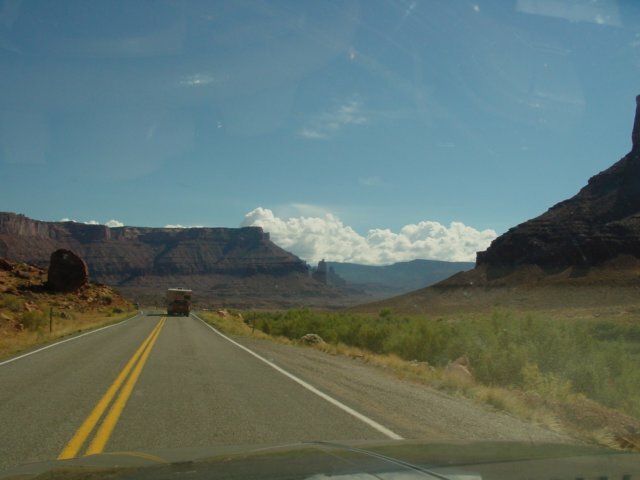 Highway 128 along the Colorado River. Coming up on the Fisher Towers. I ended up spending all day Monday replacing the rear main seal in the gravel at the Slickrock Campground next to my tent. I’m very grateful for the help offered to me from Sean and Mike. Without their help I may not have been able to get it apart and put back together. Unfortunately, when we were done replacing the seal it was still leaking oil! Since I had to drive this Jeep over one thousand mile home again at the end of the week, I decided not to waste another day trying to fix it myself and brought it to Moab Offroad Accessories to get the repairs done. I dropped the Jeep off on Tuesday morning and rented a Jeep Wrangler YJ from them for the day so I didn’t have to sit around and wait. 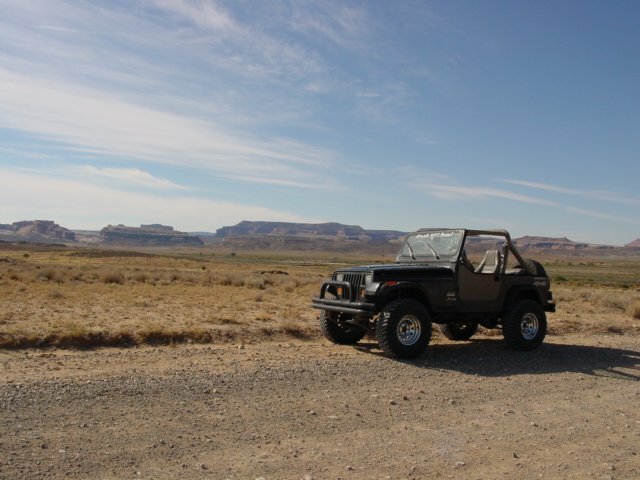 The YJ was actually very fun to drive, especially once I took the top off. 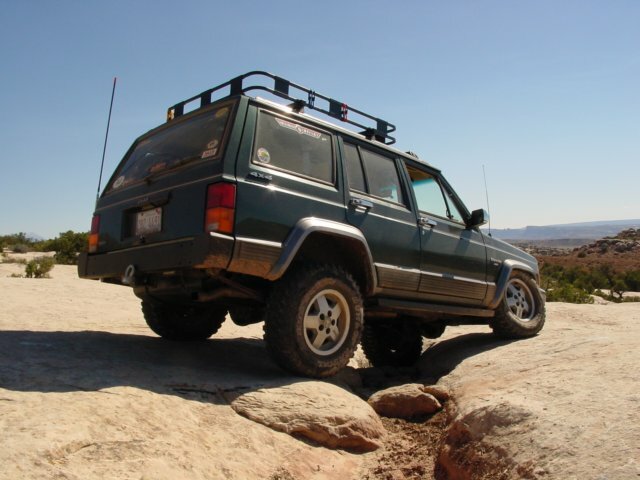 The YJ was lifted a little, had 33×12 BFG MT’s, and was locked front and rear. 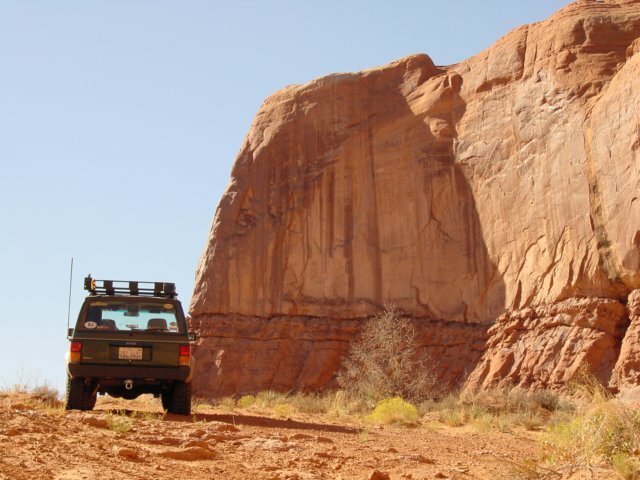 I took it out to a few easy trails including Klondike Bluffs, Gemini Bridges, and Willow Flats in Arches National Park. 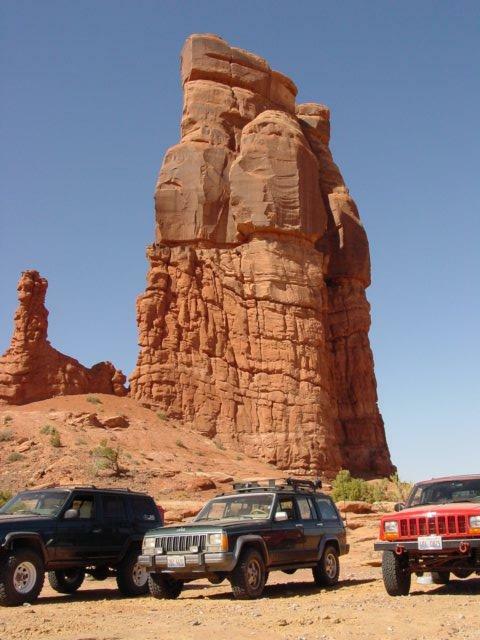 While I was in Arches, I did a little sight seeing there, too. Along the Klondike Bluffs road. 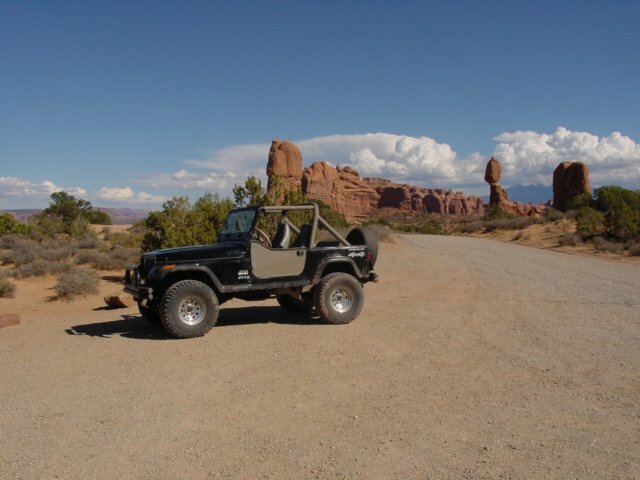 The rented YJ in Arches National Park. 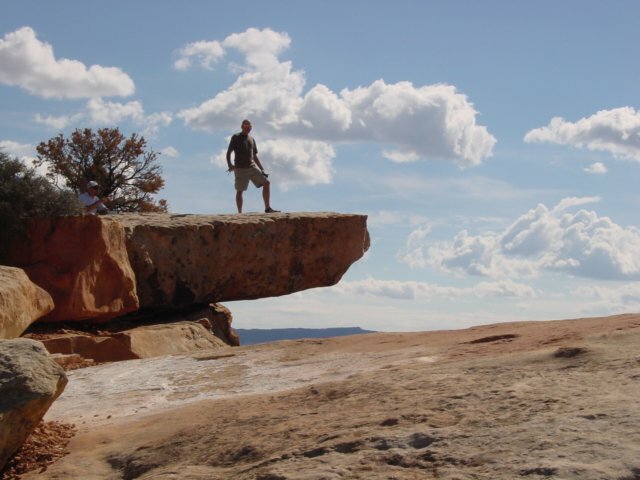 Balanced Rock can be seen in the background. 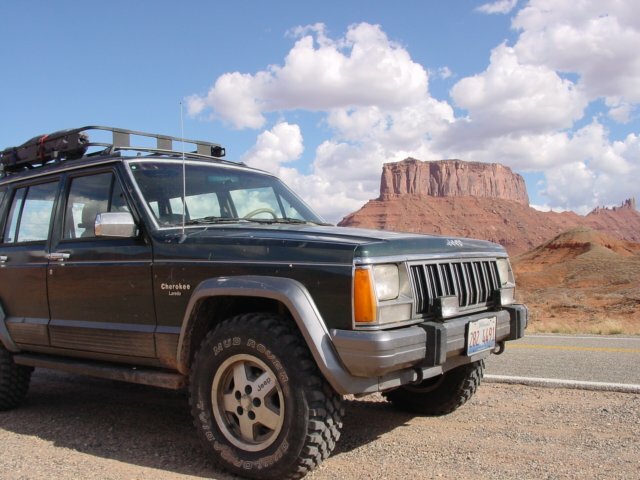 Later in the day I dropped off the YJ and picked up my XJ. It looked like the oil leaking problem was finally fixed, so I was able to use my Jeep for the rest of the week. 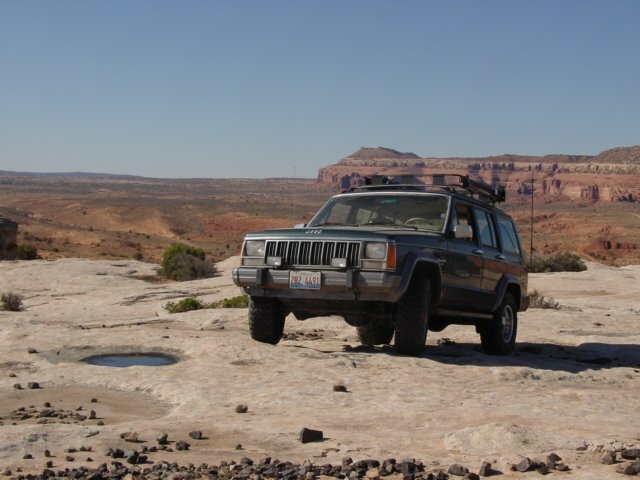 On Wednesday I went on a trail run to Seven Mile Rim and Wipeout Hill and on Thursday I checked out Klondike Bluffs again, except this time with my own Jeep. Thursday night I rode along with a friend to Fins & Things for a night run. 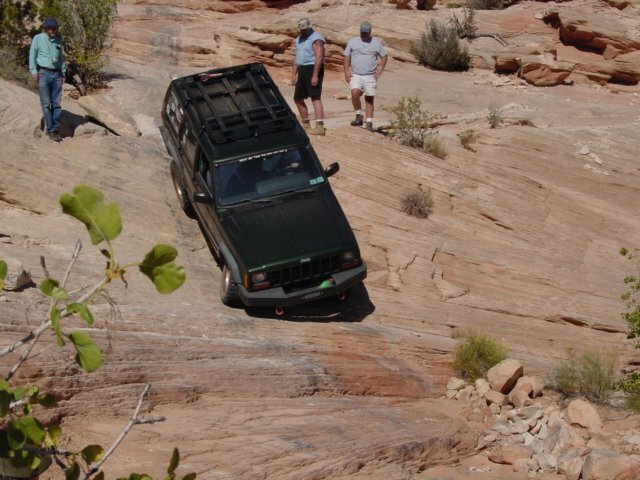 This trail had a lot steep sections on the slickrock and was even better at night! My Jeep parked at the Bartlett Overlook along the 3D Trail. 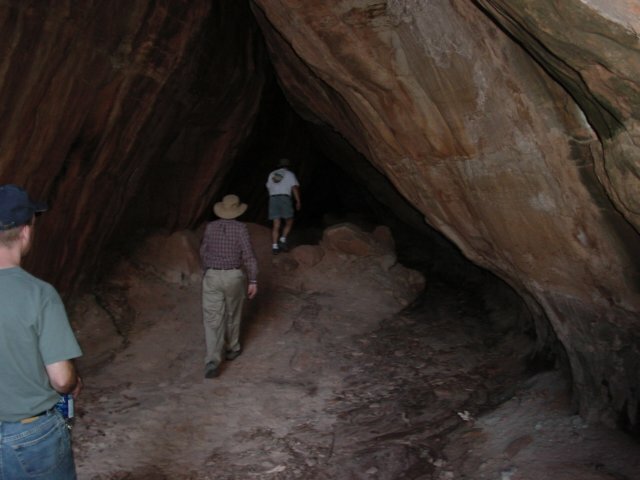 We stopped to hike through the Tusher Tunnel. 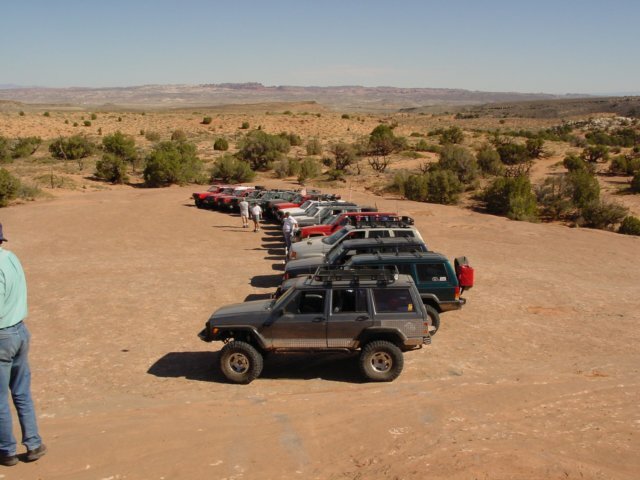 Our group lined up the Jeeps on some slickrock for a group shot. Crossing a small crack on the Klondike Bluffs trail. Thursday evening there was a Show and Shine in the park where over 120 Jeep Cherokee’s were in attendance. On Friday I joined the group trail ride up the Top of the World trail. It was a very cool trail that took us up to an overlook at the top of a cliff. The edge of the cliff dropped straight down over 2,000 feet. 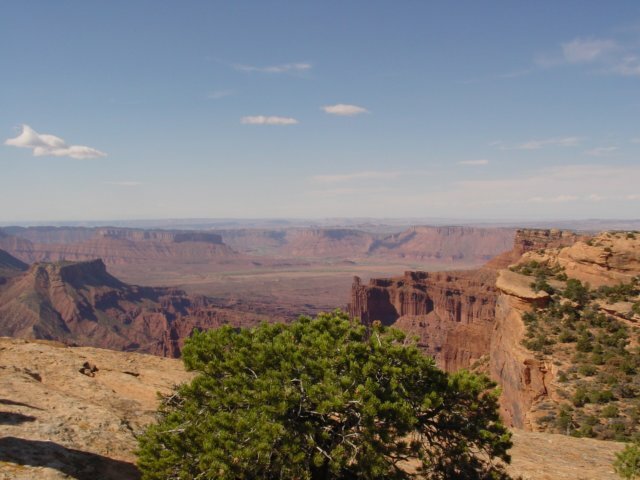 The total elevation of this spot is over 7,000 feet and offered great views of the surrounding area and even into Colorado. 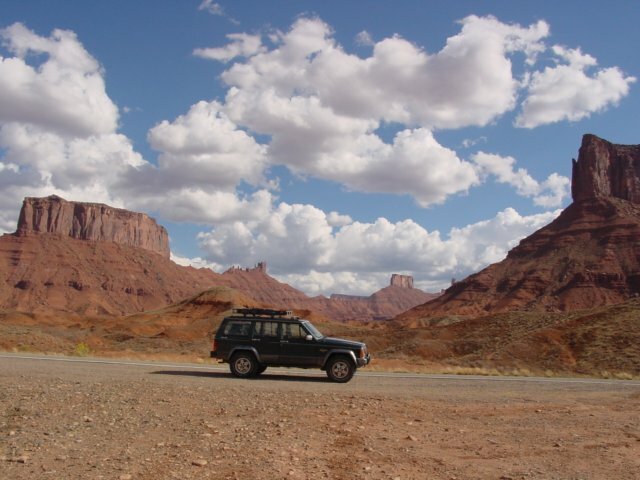 I left Moab on Saturday morning on the long drive home, and I arrived home on Sunday at about 6:30pm. It was a long drive! On my way out of town, I stopped to take a few photos along the scenic Highway 128. Unfortunately, on my drive home I started to lose some oil again, but this time it was not coming out of the rear main seal. It was also not close to as much as I lost on the drive out since I only lost about half a quart. The Jeep is now going to go into the garage until this issue is fixed. Hopefully it will be ready to get back on the trails again soon!